Tolo News: “Pakistan and Pakistan’s military were involved in the plan to attack Ghazni; Pakistan provided all sufficient aid to them and it’s very clear,” said MoI spokesman Najib Danish. 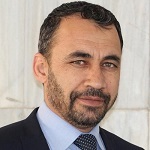 “There has been an intelligence weakness in Ghazni,” said Mohammad Radmanish, deputy spokesman for the ministry of defense. Prior to the attack, Afghan security officials visited Ghazni and pledged to the people that their city would be protected against Taliban attacks. However, video footage seen by TOLOnews shows the moment Taliban fired a missile on a gathering of security forces in Ghazni. Dozens of security force members were wounded while other can be seen fleeing the scene. Click here to read more (external link).